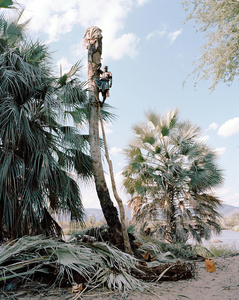 This series of eight environmental portraits was photographed in 2015 on my return to the Kunene region to distribute the posters to participants of the Ovahimba Youth Self Portrait project. 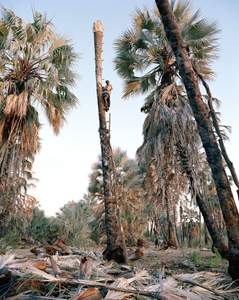 A young Himba man named Wakarerera Tjondu, whom I had met earlier in 2014, led me through the palm groves and proudly introduced me to the palm tapping process for the first time. 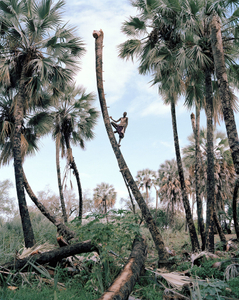 The images portray the Himba men who select, prepare and maintain Makalani Palms during the sap tapping process. Ovahimba from this area have utilized this plant species for generations, passing down the knowledge and technique needed to carry out the method of obtaining the liquid sustenance. 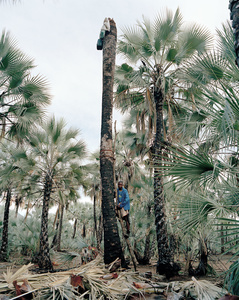 The process begins by selecting a well-aged, sizeable male palm. 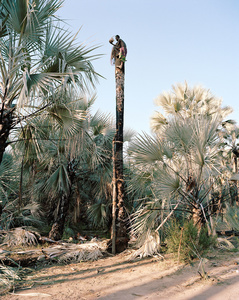 Its size and proximity to ground water will determine the amount of sap it produces, some palms secreting over one hundred liters. 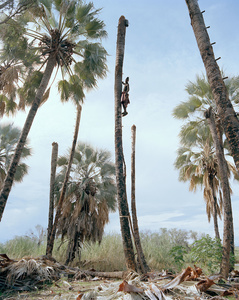 Once selected, the trunk is then pierced with stakes carved from harder wood that act as steps upward toward the leaves and flower at the top.In order to attain the sap, the men behead the palm by cutting its crown from the trunk. This sacrificial act will eventually cause the tree to die, but first the white sap rises upward filling a hollow carved into the trunk. The secreted sap is sweet and alcohol free but due to naturally occurring yeasts it quickly ferments and produces an alcoholic drink traditionally known as ‘Otusu’. 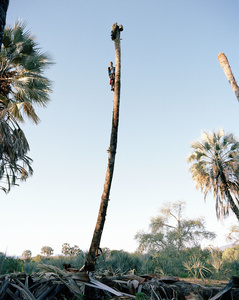 Although the Makalani Palm is a protected tree in Namibia and the tapping of Palms a banned practice, the Himba men firmly believe that it is they’re right to continue. 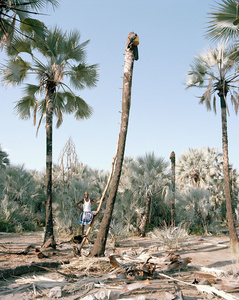 They argue against western law, instead following ancient cultural traditions that respect these Palms in their utilization and in turn promote they’re conservation on a cultural level.